Go Diving, or Dive Into History, in Honolulu - If you are planning a vacation to Hawaii, set your sights on the island of Oahu, which is the home of the state capital- Honolulu. This city is a blend of beach paradise and historic and cultural importance. When you rent a Honolulu beach house, there will be something for everyone in your party to enjoy during the day. And in the evening, the Waikiki neighborhood in Honolulu is the destination for entertainment, nightlife, shopping, and dining. Learn more here! 25th Floor Ocean Views! AC, Washerdryer, free parking! Partial Ocean Diamond Head Views + Fitness Center! TOP of the WORLD wDiamond Head and Ocean Views! Go Diving, or Dive Into History, in Honolulu - If you are planning a vacation to Hawaii, set your sights on the island of Oahu, which is the home of the state capital- Honolulu. This city is a blend of beach paradise and historic and cultural importance. When you rent a Honolulu beach house, there will be something for everyone in your party to enjoy during the day. 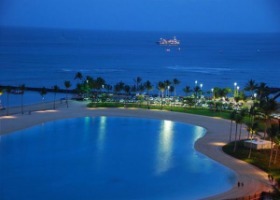 And in the evening, the Waikiki neighborhood in Honolulu is the destination for entertainment, nightlife, shopping, and dining. Waikiki beach is a popular Honolulu destination. This beach is very accessible, and augmented by amenities such as shopping and dining options right across the street. The beach itself is about two miles long. On the east end of the beach is Kapiolani Park, where you can have a picnic, go for a jog, enjoy games on open grassy areas, or indulge in some friendly competition on the soccer fields or tennis courts. The west end of Waikiki beach hosts Duke Kahanamoku Lagoon (also called Hilton Lagoon), which is the perfect place for a relaxing swim. Along the beach, there are locations for renting bodyboards, surfboards, snorkeling gear, and kayaks, so you can explore the water however you like. You can even pick a new water adventure each day! And since all the equipment can be rented, you don't have to worry about traveling with your own gear or stowing it in your Honolulu beach house rental. If you prefer the sand to the waves, you can of course bask in the Hawaiian sunshine on the beach. The diving in Hawaii is especially good. Scuba Diving magazine ranks Hawaii as having the "Best Visibility in the Pacific and Indian Oceans" and as having the "Best Beginner Diving in the Pacific and Indian Oceans." So if you are learning to dive, or looking for spectacular views, Hawaii has everything you need. If you are just starting out as a diver, the Oahu Diving company prides itself for their ability to help beginner scuba divers have a good time. You do''t need to have a license to scuba with them, since you will be guided by certified scuba instructors. On your dive trip, you can expect to see Hawaiian stingrays, sharks, tiger sharks, reef fish, and Hawaiian green sea turtles. If you are a certified diver, you will have the option of going on deeper dives, and even participating in wreck dives to explore ship and airplane wrecks on the ocean floor. This is an especially exciting prospect for divers who have an interest in history. In either case, part of your dive package includes digital photos of your underwater adventure. Speaking of history, Honolulu beach houses are not far from Pearl Harbor, where the USS Arizona Memorial resides. The memorial is built over the sunken wreckage of the ship, and is accessible from the visitor center by shuttle boats. Visitors to Honolulu come to see the USS Arizona Memorial, the USS Oklahoma Memorial, and the USS Utah Memorial, as well as neighboring sites like the Battleship Missouri Memorial, USS Bowfin Museum and Park, and the Pacific Aviation Museum (which has a variety of exhibits, but most relating to the Pearl Harbor attack). It's possible to buy a pass to gain access to a grouping of these sites, and you can rent a headset that will give you information about exhibits as you take a walk through history. If you are ready to experience the breathtaking natural beauty of Honolulu beaches and explore the area's rich history, rent a Honolulu beach house for your next trip.